Beautifully constructed, the villa is set in the most picturesque of places along the coast of Aboula-Psarou Beach. Ground Floor : Kitchen - Living groom with big traditional wooden couch (sleeps 1) and flat TFT-TV/DVD set. One bedroom with two single beds and one spacious bathroom with air conditioning, window and bath with shower. A large veranda, fully equipped (table for eating at fresco, sun- umbrella, sun beds, chairs) facing the garden and the sea! The master bedroom with a double queens size bed, air-conditioning and a suit bathroom with window and shower. From the master bedroom a window door is leading to the wooden balcony with amazing panoramic sea and garden views!! Direct sea view also from inside the villa! 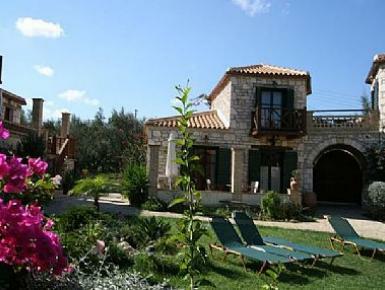 The villa is air-conditioned in both bedrooms.